Hands-down, gray is the most popular colour for kitchen cabinets and vanities these days (with navy blue coming in a hot second), but how on EARTH do you pick from all of those grays? Warm gray, cool gray, blue-gray, greige gray, green-gray – HELLS BELLS! Thank goodness you have your own personal decorator tucked in your back pocket (and don’t worry, I won’t pinch…unless you ask nicely). This is one FABulous gray paint colour. Amherst Gray sits in between Chelsea Gray (coming in 4th place) and Kendall Charcoal, which is significantly darker (and usually a touch too dark for most kitchens). Now like ANY gray, it can AND WILL pick up undertones from its environment. But generally speaking, it will act like a nice, medium toned charcoal paint colour that doesn’t have that typical taupe/purple undertone that a lot of today’s grays have. See how wicked it looks with stainless steel appliances? Just agree with me, Tim said it’s easier that way (wink wink). Metropolis is for those of you who want a slightly softer approach. I wouldn’t go so far as to say Metropolis is SUPER warm, but it definitely is softer and slightly more taupey toned than Amherst Gray. Metropolis will act like gray, without the cool edge. Sure, it says ‘gray’ but this one really is more greige than anything as it sits almost smack dab in the middle of gray and beige. If you are looking for a warmer colour, then this one could work well for you. Kingsport Gray does the job of being a diehard ‘neutral’ with more warmth and softness than the other 2. Kingsport Gray is shown here with a beautiful (and affordable) Formica countertop. A soft and subtle way to neutralize a space, yet gives some great personality. This is a wicked cool dark charcoal that is slightly warm with a VERY vague purple undertone. Wondering which gray is best for your kitchen or bathroom? Check out my affordable Online Consulting Packages! I absolutely LOVE the way you explain colors. Your posts are always so informative. I pin each of your color descriptions so I can keep the information. Wish you could explain ALL colors!!! If paint companies explained their colors the way you do it would benefit us all. Guess they make more money from our mistakes, lol!! Been wanting to move to more neutral colors, but they just don’t feel right even when I pick from those listed in the pictures I love. Just finished re-painting a newly planked wall for the third time and still don’t like it. My problem is I’m trying to use the pictures/decor I already have and they don’t work with the colors I want to use. Budget constraints limit changing things. Most of my stuff is either red/golds of Tuscan decor or creams/dirty greens of cottage/floral. Oh well, am using up a lot of old paint by mixing colors! I love greens and would like to get rid of any reds, perhaps I’ll try the golds next and see if that helps my stuff work. Keep up these excellent explanations!! These are all gorgeous colors for cabinetry. I wouldn’t have thought to put Amherst with Grant Beige, but it looks like it works well. Thanks for another great post! Thank you Beth! I think Grant Beige is a greatly underused, but super awesome colour. I find so many beige/tan colours overly yellow and this one is just so grounded. Perhaps you should consider investing a few minutes of your time to take photos…and then a few dollars to get superb ideas from Kylie. it would ultimately save you a ton of time, money and grief! … AND produce results you will love…and will have learned from. What type of finish would you use for these paints in a kitchen when painting over oak cabinets? Gloss? Semi? Matte? Great questions Rose! My FAVOURITE paint for cabinets is Benjamin Moore Advance in Pearl finish. I’ve tried the semi-gloss, but I found it a bit too reflective/shiny. We have the pearl on our kitchen and bathroom cabinets and it’s just perfectly wipeable with a small amount of sheen. Generally speaking, I find semi-gloss in MOST brands a bit too shiny and I’m inclined to go 1 step down. Kylie ~ Is that the Soapstone Sequoia with the kingsport gray? What is the countertop in your bathroom? Love both! Great colors…thanks for the very informative posts. I enjoy every one of them! Thank you Valerie! 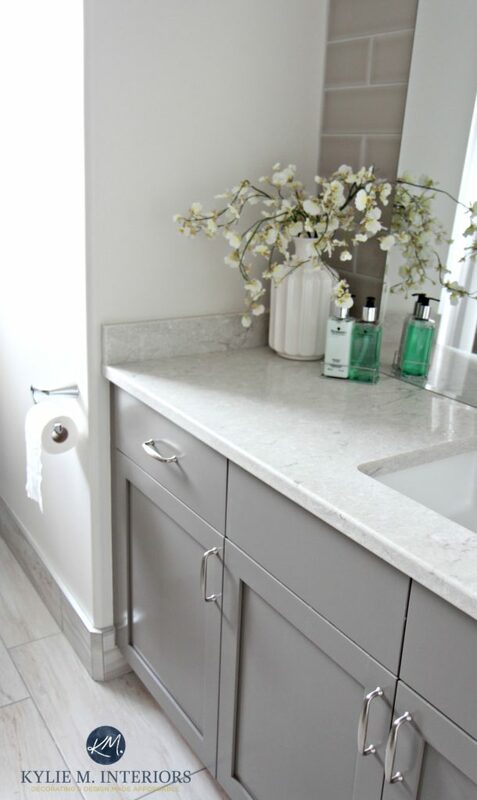 With the Kingsport Gray, the countertop is Formica Silver Travertine which is a laminate. In our bathroom it is Caesarstone Bianco Drift which is a quartz that I’m MAAAADLY in love with. Hope that helps! Hi Kylie, Where did you buy the vanity that you painted Kingsport Gray? Do you hire someone to paint it for you? Or do you paint the vanity yourself? I can’t seem to find simple cabinets at Home Depot or online. Please help! Love your ideas and photos. Love the Amherst Gray. Just painted our vanities that color. Looking for a soft gray/white wall color. Most samples come off as blue. Any suggestions? Hi Kylie, I have relied on your blog many times for advice and it is always so great! Do you think a bathroom vanity painted Kingsport Gray would work in an east-facing bathroom with Edgecomb gray walls? Just wondering if you think Edgecomb and Kingsport would compliment each other well. Hi Kylie, love your site! It’s been very helpful. I’m in the process of “neutralizing” my ensuite bathroom. It has a forest green counter and almond fixtures. I found a shower curtain (soft blue/greens, off white and a sandy color) with pattern and a bath mat which is a soft blue/green color which seem to work. I think I will paint the walls either revere pewter or gray cashmere by Benjamin Moore…leaning more towards gray cashmere….I also have tiled floors that are sort of a almond with almost a slight peachy color to them. I was painting the cabinets White Dove by Benjamin Moore, just because I have some on hand really, but find it a bit too white. Would you say either a creamier white or darker brown like Kingsport gray for the cabinets would neutralize those colors more? Hi Kylie – do you have a favorite Sherwin Williams gray color for cabinets? I’ve read so much about Dove Tail, but it looks like it has purple undertones in it. I really like SW Hammered Zinc, but haven’t read or heard any reviews on it. My kitchen will be painted Repose Gray. Thanks so much! Hi! In your opinion what is the best gray color to paint kitchen cabinets, with dark wood floors and tan walls? Thanks! Sweet, I hope it turns out just how you hope! Getting ready to do a master remodel. We are keeping countertops and tile around garden tub which are a lighter tan. We will paint cabinets and do new floor and are wanting to do more of a taupe/gray feel. Ideas on cabinet paint color and floor color. I’m thinking of choosing cabinet paint color first and then moving on to choosing floor? Any ideas would be so helpful…. feeling overwhelmed! !